Back in December when Joe Veleno was traded from Saint John to Drummondville, it marked the best thing that could’ve happened to him. As he packed his boxes in preparation to leave the Maritimes, the young phenom had only 31 points in 31 games. While a point per game is nothing to sneeze at, when you’re the star of your team, a face of your league and the apple of many scouts’ eye, it’s a modest harvest. Upon his arrival with the Voltigeurs, the 18-year-old caught fire and ended up with 48 points over his 33 games with Drummondville. Little by little, experts began seeing the Veleno of old, the one who had piled up 52 points in 41 games with Lac St. Louis in Midget AAA as a mere 14-year-old. 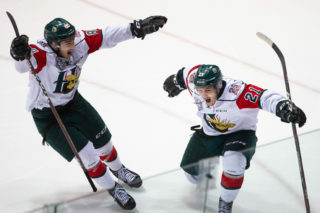 That was, of course, the year he earned his exceptional player status to join the QMJHL as an underage player ahead of the 2015-16 season. Veleno remains the only player in Q history to have earned that status. Then at age 15 he put up 43 points in 62 games that first season with the Saint John Sea Dogs. Since then, Veleno has come to embody what NHL teams are looking for; a player of the future who hasn’t stopped developing and who is able to perform and stand out in all game situations. It seems that everywhere he ends up, Veleno is busy learning and gaining experience. In 2016-17, he helped the Sea Dogs win the President Cup with 11 points in 18 playoff games before taking part in the Memorial Cup in Windsor, Ontario. Even though the Sea Dogs failed to win it all, he matured a great deal and that showed this past season. “My start to this season with the Sea Dogs wasn’t easy. We were one of the worst teams in the League and I didn’t produce the way I had hoped. It was pretty disappointing,” he explains, especially given how he was on the radar of all NHL scouts. “It was a huge year for me and my future and I knew that. 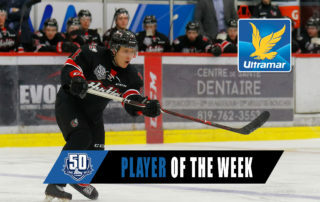 I also knew that the Voltigeurs acquired me for my leadership,” says the talented forward, who built off his strong end to the season with Drummondville to then rack up 11 points in 10 playoff games for the Voltigeurs. Ranked No. 8 among North American skaters ahead of the NHL Draft and among the two highest prospects among available centres, Veleno will once again be in the spotlight during the upcoming 2018 NHL Entry Draft. But since earning his exceptional player status, and even a few years before that, Veleno was quite accustomed to being scrutinized. 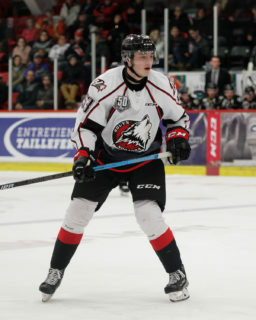 Selected first overall at the 2015 QMJHL Draft, the Kirkland, Quebec native used his international appearances with Hockey Canada to expand his exposure. Despite being a year younger than most of the players he was facing, Veleno was still able to stand out with Team Canada Black at the World Under-17 Hockey Challenge in 2015, ending the tournament tied for his team’s lead in points. 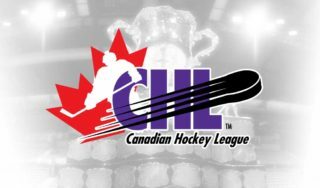 The ensuing summer, Veleno rejoined Team Canada for the Ivan Hlinka Memorial Cup. Despite failing to get a medal, he would end up leading his team in assists and ranked second in points. One year later, Veleno was at it again at the 2017-18 Ivan Hlinka tournament, this time wearing the captain’s “C” on his jersey and leading Canada to gold with seven points in five games. 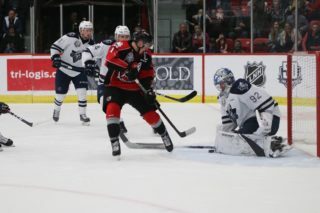 His last taste of international competition came this past April when he joined Team Canada at the IIHF Under-18 World Championship following the Voltigeurs’ elimination from the playoffs. In four games played he amassed three assists.